Saudi Arabia's flynas is returning to its origins as a regional airline. flynas has ended scheduled long-haul flights, which did not garner enough awareness and were met with a strong competitive response and had a limited schedule. A large number of routes were spread too thin in a short period of time, which quickly accumulated losses. flynas will retain long-haul chartered flying. In 2015 flynas will keep its fleet flat at 24 A320s but seek to boost utilisation from about 10 hours to 12 hours. flynas aims to carry 6 million passengers in 2015, up from 3.5 million in 2013. Domestic prospects are boosted now that flynas has secured a major victory with regulators who have lifted the fare cap on domestic economy tickets. flynas can charge more for its highest priced seats than Saudia, which receives subsidised fuel and, with an 82.5% load factor, often sells out of seats. Low-risk innovation will occur as flynas seeks more partnerships. flynas may need to take bolder measures in 2015 if it wants to make a competitive response to the planned entry of two new carriers in Saudi – Al Maha Airways and SaudiGulf – but for now flynas believes the two start-ups will focus on other parts of the Saudi market and not low-cost travel. In Nov-2014 flynas named Paul Byrne as its CEO. Mr Byrne had been a commercial advisor to flynas and replaced Raja Azmi. Mr Azmi was a former executive at AirAsia and brought with him a number of staff at AirAsia to transition what was then Nas Air into the LCC flynas. Mr Byrne credits Mr Azmi with turning around the operation, including boosting on-time performance to 90%. Mr Azmi however also presided over the short-lived long-haul experiment. Mr Byrne says Mr Azmi remains at flynas along with the former AirAsia staff. Mr Byrne’s objective is to continue the short-haul LCC network Mr Azmi created. "I don't have to reinvent that wheel," Mr Byrne says. flynas is budget but with frills to cater to the plushier Saudi market; Mr Byrne says flynas could take more costs out of the business but doing so would dampen consumer demand. The dynamic at flynas is Saudi staff localising and making acceptable to the Saudi market the low-cost ideas from the ex-AirAsia staff. Mr Byrne aims to bring flynas to profitability using Mr Azmi's short-haul model. This continuity should boost morale internally at flynas, whose Saudi staff have witnesed a number of executives in a short period. Keeping a low profile and bedding down growth is appropriately conservative and what flynas needs before it considers its next move. Mr Byrne also notes that with past CEOs having enjoyed only short tenures, he is more likely to realise a concise strategy than anything ambitious. However, plans could be compressed if a competitive response is necessary to Saudi Arabia’s new entrants. flynas quickly wound down the 'Global Flight Program', the long-haul operation it ramped up in Apr-2014. The offering saw flights to Casablanca, Islamabad, Jakarta, Karachi, Kuala Lumpur, Lahore, London Gatwick and Manchester. Expansion plans included Paris. flynas announced the suspension of the programme in Oct-2014. flynas' scheduled services to those destinations have ended, although flynas still offers charters to Jakarta and Kuala Lumpur. flynas has not opened service to Islamabad and Lahore with its narrowbody aircraft, which would have sufficient range to reach those points, unlike the other 'Global Flight Program' routes. flynas’ problems were varied and are not indicative of the low-cost long-haul strategy. Sceptics no doubt will over-simplify flynas’ failure as reflecting on the whole low-cost long-haul concept. It was probably more a case of not getting the strategy sufficiently coherent. flynas’ long-haul strategy was a blend of concepts offered by other carriers. In large part it echoed Cebu Pacific’s operation to transport market-specific passengers; in flynas’ case this was passengers making religious trips to Saudi. flynas launched Manchester service to cater to the large Muslim population in central England. flynas under-estimated the competitive response as Saudia pre-empted flynas' arrival in Manchester. There was also the segment to bring expatriate Saudis home to visit, the concept behind flynas’ London Gatwick route. However flynas could not attract enough attention at Gatwick from Saudis who were used to British Airways and Saudia services from London Heathrow. flynas also suffered from having a smaller reputation at home, meaning expatriate Saudis were unlikely to have heard of the airline. Scheduling was less than ideal with flynas offering flights to London via Jeddah or Riyadh depending on the day of the week. Balancing peak and off-peak traffic was challenging. The Saudi market has periods where demand drops steeply due to holidays. flynas did not follow other low-cost long-haul carriers in having a high density configuration but nor did it pursue a sufficient premium offering in the Saudi market. Saudi has a far higher luxurious orientation compared not just to the Asian bases of other low-cost long-haul carriers but a luxurious orientation that rivals few if any other markets. flynas returned its two long-haul A330 aircraft, which were wet-leased from Hi Fly of Portugal. flynas at one point looked at having upwards of seven widebody aircraft. flynas maintains service to Jakarta and Kuala Lumpur as scheduled charters for religious traffic. A 747-400 is wet-leased for the Kuala Lumpur route while two A330s are wet-leased for Jakarta, according to Mr Byrne. Indonesia and Malaysia have large Muslim populations. Mr Byrne says flynas remains interested in profitable pre-booked long-haul flying. This would be done as charters with wet-leased aircraft and not regularly scheduled routes. On charters for religious trips to Saudi Arabia, travel agents are providing not a few hundred or thousand bookings but rather tens of thousands, thereby guaranteeing profits. flynas’ scheduled long-haul attempt ultimately tried to serve too many segments and did not succeed in any. flynas quickly amassed a thin network spread over many disparate points. Bedding down so many markets was difficult and exacerbated by the long-haul project being new. It could be interesting to re-examine long-haul prospects in a few years when flynas has a larger network and visibility. flynas has won a long-sought concession from Saudi regarding domestic market conditions. flynas was double handicapped: Saudia being the national carrier received cheaper fuel (previously estimated at one-fifth the market rate) while flynas did not. Further, there was a cap on fares in the domestic market effectively making it difficult to impossible for other airlines to earn a profit on domestic routes. This was a hangover from the days when Saudia enjoyed a monopoly and was designed to prevent price gouging. But for low cost airlines, which need to increase fares as flights fill, to compensate for the very cheap stimulative fares, this spelled disaster. Sama, which has exited the market, as a result reportedly did not even expect to earn a profit on domestic routes. Saudi Arabia has changed its policy and flynas within 10 days of departure can increase its fares up to 80% higher. Before 10 days flynas was capped at SAR280 (USD74.61) one-way, Mr Byrne says. Saudia is still capped and is not allowed to increase economy fares, although it can increase business and first fares. A spot check on fares for the day before departure shows Saudia has only a handful of economy seats at SAR310 (USD82.61) while flynas offers economy seats at SAR449 (USD119.65). For fares booked for travel the same day, Saudia has only a few seats for sale at SAR310 (USD82.61) while flynas charges SAR499 (USD132.97), higher than its one-day advance fare of SAR449 (USD119.65). Once Saudia sells out in economy, passengers have the option of a premium seat that could cost around SAR1000 (USD266.48) – twice that of flynas' economy rate. Mr Byrne says the Jeddah-Riyadh route has been good for both flynas and Saudia. Saudia holds limited interest in the domestic market; it has also been frustrated by the fare cap. 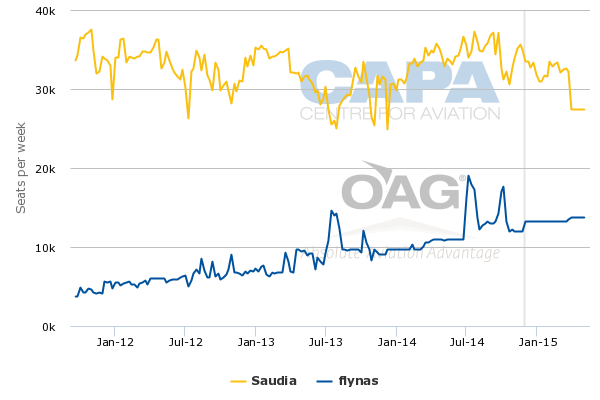 Saudia has had relatively flat capacity on the Jeddah-Riyadh route, although there were sharp decreases during the MERS health scare. flynas' expansion has seen Saudia lose marketshare, falling from 90% in Sep-2011 to 74% in Sep-2014 and a projected 71% in Mar-2015. Separate to the fare cap change, flynas in Oct-2014 began accepting bookings for a year in advance, increasing revenue streams. There is a theoretical risk that growth of Saudia in the domestic market could provide more lower-priced tickets (at the fare cap level) and shut out flynas. But that would be against the bold measures Saudi Arabia has taken to stimulate growth. Further, Saudia has not shown interest in large growth domestically. 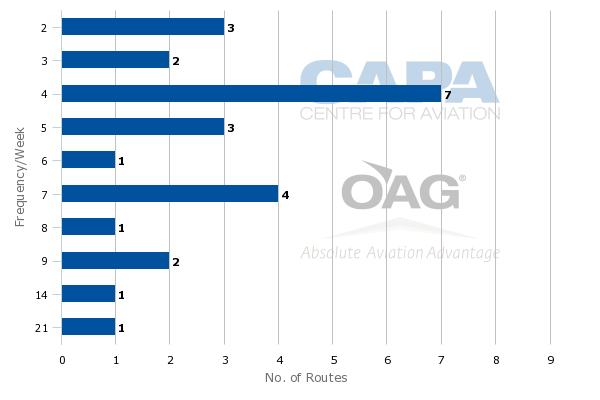 While Riyadh-Jeddah has seen flat performance from Saudia, Saudia has grown on other domestic routes. But 2013's full-year domestic passenger carriage of 14.7 million was up only 3.5% from 2012's 14.2 million figure. flynas aims to transport 6 million passenger in 2015. 2014 full-year figures are not yet available, but flynas carried 3.5 million in 2013, 56% of whom were domestic passengers. This was approximately 10% higher than in 2012. flynas is projected to have 23% domestic marketshare in Mar-2015. The carrier previously stated an objective to have 30% domestic marketshare and 20 million passengers by 2020. However, this figure was stated in the lead up to flynas' long-haul project, the wind-down of which should impact the 20 million growth projection. But the 30% domestic marketshare figure remains feasible. flynas expects to keep its commercial fleet flat at 24 A320s, which typically comprises 22 in-service aircraft, one on standby and one undergoing maintenance. flynas' utilisation rate averages around 10 hours a day, although this is comprised busy periods, when the utilisation rate increases to as high as 14 hours a day, and quieter periods during holidays when Saudis curtail travel. In 2015 flynas will need to perform six C-checks and aims to concentrate these on the quieter periods. 2015 sees the objective of boosting the average utilisation rate to 12 hours a day. Some load factor gains may be recorded; flynas in 2013 had a domestic load factor of 80.2% compared to Saudia's 82.5%. Saudia's load factor is particularly impressive given the lax fare conditions on domestic tickets, although the carrier has been clamping down. Growth in frequency is a higher objective than opening new destinations, which is costly and comes as the carrier settles down from the long-haul losses. Limited new market openings are likely. 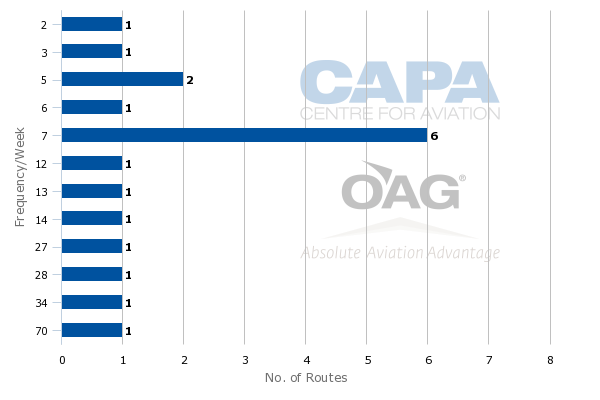 Seven of flynas' domestic routes see service more than daily while six see daily service and five see less than daily service, according to OAG data. Nine of flynas' 25 international routes see at least daily service. Mr Byrne is keen to have schedule integrity "but not fly seven times a week because that's the thing to do". Standouts in flynas' network according to Mr Byrne are Khartoum and Cairo. flynas would like to grow in Cairo, supplementing its existing Cairo-Jeddah service with Cairo-Riyadh, but Egyptian authorities have told flynas slots at Cairo are unavailable. Beirut was a strong route but changes in airspace due to overflight concerns saw the flightpath become so circuitous the route was no longer sustainable. "We've had profitable routes disappear on us," Mr Byrne reflects. Mr Byrne expects to retain flynas' share of traffic as 60% domestic and 40% international within 3.5 hours. 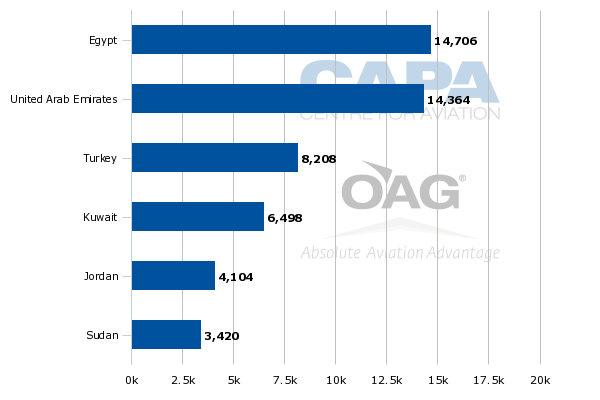 About half of flynas' international seat capacity is within the Middle East. The launch of flynas’ long-haul programme did prompt questions whether its partnership with Etihad Airways would remain given the potential overlap. Ending the long-haul programme essentially makes this concern moot, and Mr Byrne affirms the Etihad partnership will remain. flynas codeshares on Etihad's flights to Abu Dhabi and beyond to Asia, Europe and South America. OAG schedules do not show Etihad codesharing on flynas routes and flynas does not serve Abu Dhabi. flynas is also seeking new partners, in particular to build incremental traffic on its network as airlines look for onward access provided by carriers other than Saudia. flynas uses Navitaire and so can facilitate interlines and codeshares but Mr Byrne said he favours partnerships that are simple to implement. This includes a preference for codeshares over interlines since flynas will not have to manage interline accounting. As flynas looks to cement its core short-haul proposition, Saudi Arabia is preparing to welcome two new entrants. Al Maha Airways is owned by Qatar Airways while SaudiGulf is owned by a consortium linked to Bahrain’s Gulf Air. Saudi Arabia granted two licenses to entirely foreign-owned carriers in a bid to increase interest in its market. 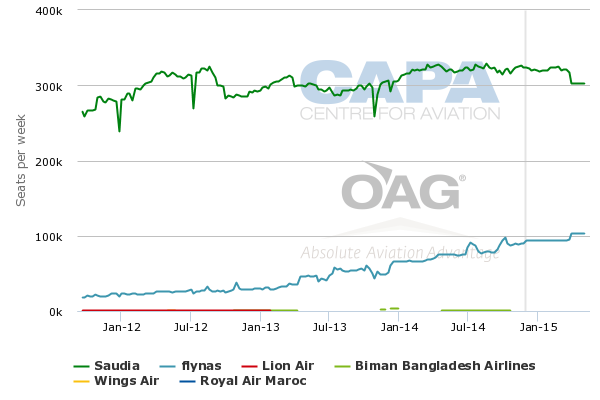 Past liberalisation attempts saw licenses awarded to locally-owned Nas Air (now flynas) and Sama, the latter of which exited the market. Allowing foreign ownership increases interest and can bring stability by having larger foreign owners, like Qatar Airways. Some countries like Australia and Chile permit 100% foreign ownership of airlines that fly domestically but not internationally. Traditionally highly conservative Saudi Arabia stands out in this, pushing liberalisation to levels rarely seen in aviation. Saudi is considered a closed and difficult market, making this liberalisation stand out in contrast. Viewed another way, that insulation left few options to increase air transport. Al Maha has had the more visible profile so far, in part because Qatar Airways is behind it. Al Maha’s launch has been repeatedly delayed but an early 2015 launch date is now targeted. Specifics of the strategy are still to be disclosed, but Mr Byrne expects Al Maha to enter the Jeddah-Riyadh trunk route, the largest by far in Saudi. Beyond Jeddah-Riyadh domestic service, Al Maha may focus on feeding Qatar’s Doha hub, providing flights from Saudi airports to Doha for onward traffic. 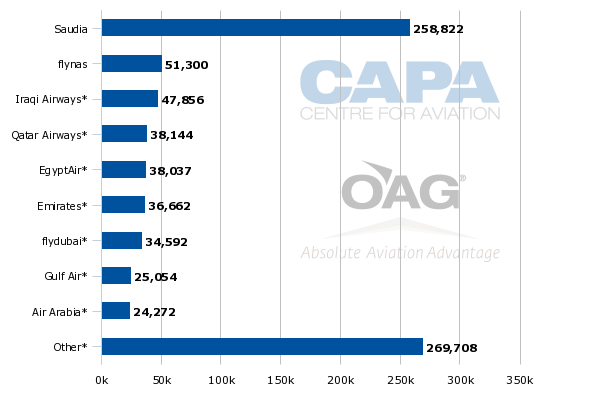 Qatar Airways is the fourth largest airline in Saudi Arabia based on international seat capacity. Qatar serves seven airports in Saudi. Al Maha’s branding uses Qatar’s distinctive oryx, but in green (associated with Saudi) rather than maroon (Qatar’s colour). Al Maha last stated it expects to launch with 10 aircraft and will add 10 to 15 annually until it reaches a total of about 50 narrow and widebody aircraft. Its initial aircraft, an A320, is being prepared for delivery from Toulouse. SaudiGulf has had a lower profile. It is known to have secured an initial four A320s and 16 CS300s. SaudiGulf's strategy is unconfirmed but one expectation is that it will use the regional jets in a more premium position from a base in Dammam. Dammam is across the causeway from Bahrain, Gulf Air’s hub. By air Dammam and Bahrain are only 54 miles apart. Bahrain effectively serves as a de facto hub for Dammam and eastern Saudi given the ease of movement of Gulf Cooperative Council citizens (including Saudi and Bahrain) as well as cargo. Gulf Air has experience in Dammam, having built up a presence there. flynas is wisely lowering its head and concentrating on its short-haul strength. After the pulling of scheduled long-haul routes, there is little appetite, strategically or financially, for something bold. flynas partially saw long-haul as a way to grow outside of a limited domestic market, but with the domestic market seeing changes in the fare cap, there is greater potential for flynas. There are also regional opportunities. Mr Byrne hopes a tighter focus will quickly improve financial results, but he notes a break-even in 2015 may be optimistic still. Although the focus is profits ahead of growth, Mr Byrne says that may change if the competitive environment dictates. With Saudi Arabia demanding a hybrid type of service, changes to flynas cannot simply echo other LCCs but rather require experimentation, which consumes time and cost. The challenge will be to balance short-term financial objectives with long-term strategic aims.